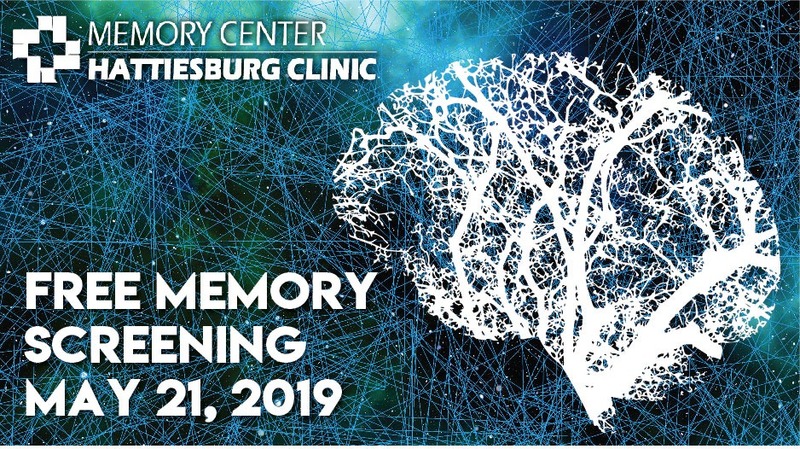 Hattiesburg Clinic Memory Center is offering free memory screenings for the public Tuesday, May 21, 2019, at its location on the sixth floor of the clinic’s main facility, 415 S. 28th Ave. in Hattiesburg. The pre-scheduled screenings will be held from 8:30 a.m. to 11:30 a.m. The screenings are available to people ages 45 and up. Registration is required in advance. Participants must check in at the front desk. A memory screening is a series of questions and/or tasks that take about 20 minutes to complete. The screening can indicate if someone might benefit from a comprehensive medical evaluation. However, it is not intended to diagnose any illness or replace consultation with a qualified health care provider. Space is limited and sessions fill up quickly; therefore, early registration is recommended. Screenings at Memory Center are available on select dates throughout the year. Every 65 seconds, someone in the United States develops Alzheimer’s disease, according to the Alzheimer’s Association. Early diagnosis allows for treatment to slow the progression of dementia and Alzheimer’s disease. To register for a screening, contact Memory Center at (601) 268-5620. Memory Center operates with the multifaceted goals of providing clinical evaluations for patients who may be dealing with neurological disorders, while also establishing a gateway for access to clinical trials that contribute to Alzheimer’s research. Memory screenings, also known as neurocognitive screenings, are one of many services offered by the center. “Neurocognition” refers to the higher brain functions: learning, remembering, concentrating, solving problems and making decisions. Neurocognitive processes are active in virtually all of our day-to-day activities. To learn more about Memory Center and its screenings, click here.